Another study predicts adverse effects for one of the world’s greatest rivers if no action is taken. A new study by Vietnam predicts adverse effects along the Mekong River if 11 proposed dams are built on its lower mainstream. Experts have long warned that the Mekong River, which flows from China into mainland Southeast Asia and provides food, water, and transportation to tens of millions of people, could be at risk as riparian nations build a string of dams to fuel their economic development. Now, yet another new report has reiterated this warning. 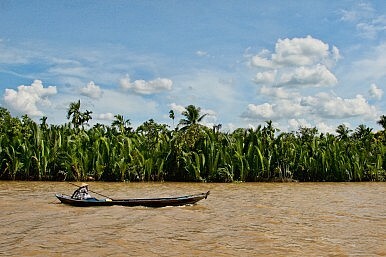 According to a two-and-a-half year study submitted by Vietnam to the Mekong River Commission (MRC) – an intergovernmental body for dialogue and cooperation in the Lower Mekong River which also comprises Cambodia, Laos, and Thailand – “high to very high adverse effects” are expected on some of the key sectors and environmental resources in Cambodia and Vietnam. The so-called Delta Study is named as such because it surveys the impact of hydropower development on the Mekong Delta, which is home to 20 million people and accounts for more than half of Vietnam’s rice and fruit production. Though the MRC released a statement Monday on the 94-page final report, which is based on two volumes of impact assessment reports totaling 800 pages, it has refused to make the document itself public as yet. The study was conducted by experts from Vietnam and Denmark’s DHI Group, with input from specialists from Cambodia and Laos as well as the MRC. However, the MRC did say in its statement that the report’s findings would be incorporated into the Council Study – or, the more unwieldy “Study on Sustainable Management and Development of the Mekong River Including Impacts of Mainstream Hydropower Project” – the MRC’s flagship study, which was commissioned by the MRC Council in late 2011 and is set to be completed in 2017. That study assesses how different water resource uses will impact the river basin using various scenarios to provide scientific, evidence-based data to understand the risks and benefits of development initiatives there. MRC Secretariat CEO Pham Tuan Phan said that he believed the two studies “are complementary,” and would help validate the MRC’s study on the impact of these initiatives in the region. Thailand and Laos trade barbs.